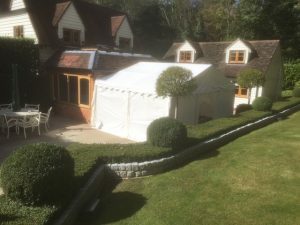 We joined a marquee to a garden building at the bottom of a garden in Hutton Brentwood. 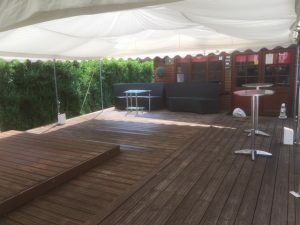 The decking was carpeted, then the grass on the lower area was given a wooden floor and carpeted. We used our diesel heater to keep the quests nice and warm. I was just sent this photo from a client. 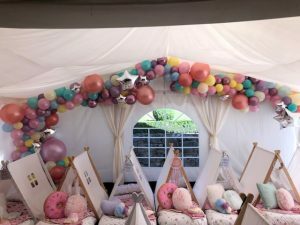 She arranged a great Sleepover for her Daughters 6th Birthday. 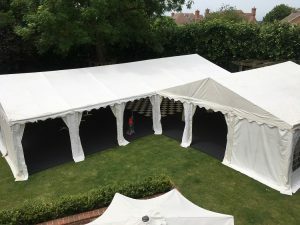 She built tents in the marquee. 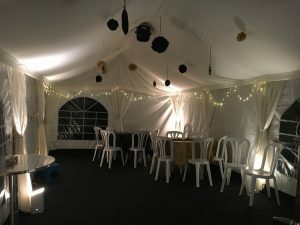 We supplied the marquee with heaters to keep them warm and cosy all night. 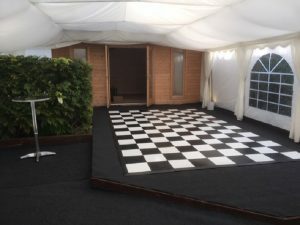 We built a ‘L’ Shaped marquee to fit around a patio area in a Felsted garden. 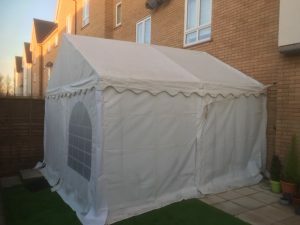 It gave a great open area, with the sides open. 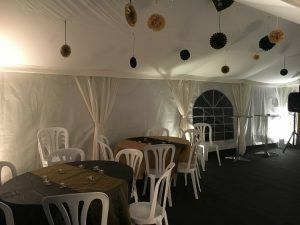 It was designed to hold 140 people inside. 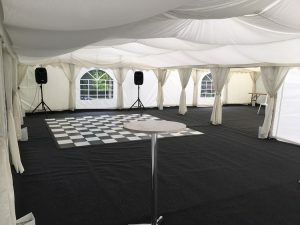 The client also ordered the wooden flooring and carpet, a 4m x 4m dance floor and active speakers. Along with Poseur tables. 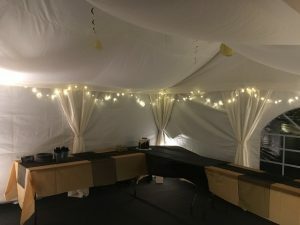 I just wanted to say thank you for the marquee for our wedding party. 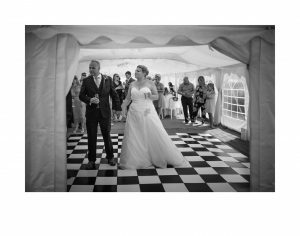 Everything was hassle free with you from the initial consultation, email follow ups and the putting up/taking down of the marquee. 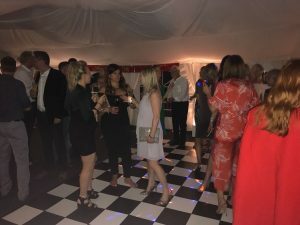 All our guests commented how impressive it looked and the amount of space created was incredible. 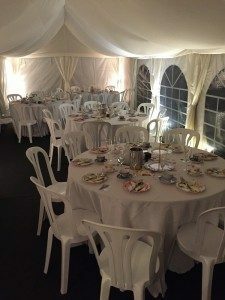 The extras of lights, tables and chairs also gave us everything we need for our celebration. 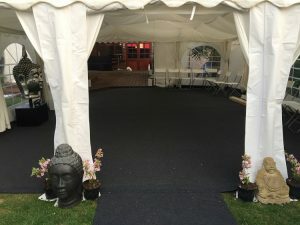 I’ve only got a few photos of the marquee and they don’t really do it justice. 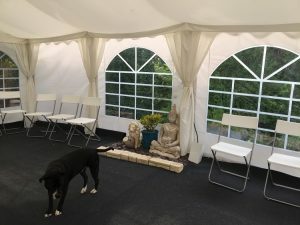 I’ve also included a photo from the day after where I used the marquee for a yoga class. 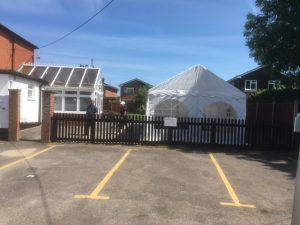 We’ll definitely recommend you to anyone who needs a marquee. 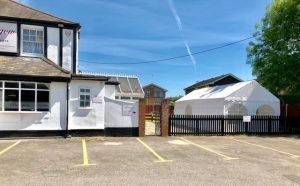 The Bongow Indian Resturant in Kelvedon Hatch asked for additional restaurant area this weekend, so we supplied them with a 4m x 8m marquee, wooden flooring, carpet, lighting and heating. It seemed to work well. 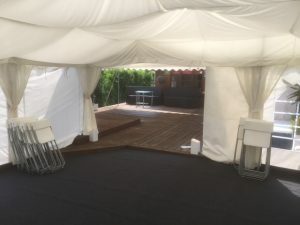 We built a long marquee, but this time with a 4m x 4m marquee added on the side, it was used as the Bar / Pub area. 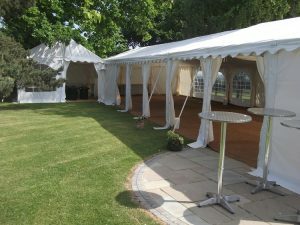 One of our clients send some photos of a marquee we built in Wickham Bishops in Essex at the weekend.